I had the great good fortune a few years back to take classes at the Vancouver School of Theology, in Vancouver, Canada, in the Indigenous ministries program. In one of those classes we spent some time telling food stories. The people in the class were First Nations people from Canada, Alaska, and the United States, and Anglos from the same places, and one fellow from Africa. Our professor had us tell food stories because they reveal so much about culture and relationships with one another, and with the land. The class was about food, water, and sustainability. A Navajo woman told us about the corn and the corn pollen. Corn is one of the main staples of the Navajo people. It's an important food item, and every spring, many Navajo families plant large fields of corn. But its use goes far beyond just nutrition--it's also an important part of Navajo prayer. The pollen of the corn is dusted off the tassels and used in ceremonies as a blessing, and is offered in prayer. Corn is used to make many traditional dishes, including kneel-down bread, blue corn mush, dried steamed corn and roasted corn. The corn is also used during a ceremony when a Navajo girl comes of age--a large corn cake is cooked underground in a circular pit lined with corn husks. Well, that's her story. And I had an opportunity to tell my story. About Lefse, of course. I told them that my mother, who was of Irish descent, stood next my great aunt Minnie, who was Norwegian, as she mixed the Lefse dough, the potatoes and the cream and the flour, until the consistency was just right. Just right could only be felt, not measured. 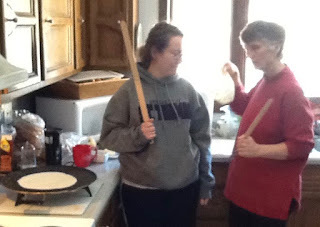 My mom stood by aunt Minnie while she rolled the dough out flat on the lefse rolling board, with the lefse rolling pin, until it was just right. There was no way to measure that, you just had to feel it. My mom stood by aunt Minnie while she pealed the lefse off of the lefse rolling board and set it flat on the griddle over the wood fire of the kitchen stove. I stood by my mother's side, feeling the lefse dough to see that it was just right, rolling the dough until it was thin enough, placing it on the electric lefse griddle as it turned just a little bit brown. My sons, my daughter in law, stand by my side, mixing the potatoes and the flour until the dough is just right, rolling it out just thin enough, placing it on my mother’s lefse griddle until it is just a little bit brown. The story is as much about the corn pollen, or the lefse, or the tortillas, or the bread, as it is about the relationship, the connection to those who came before, and those who come after. It is about who we are and to whom we are related. It is about how our diverse cultures form us as a people, and how our story sustains us. The story we hear today from Exodus is a story like that. It is a story that forms Israel as a people, and it is a story that remembers who they are. Today's portion of the story almost reads like a recipe, it is that and it is a call to remembrance and to reconciliation and forgiveness. It says this is who we are and what we do together, this is what we eat, why we eat it, when we eat it, and who we worship. It calls Israel to remember. This story says to the people, and to us as well, this is hard, being a people is hard, and you can do hard things. This is a story of survival, of tragedy, of heartache, and of hope. It says, if we can hang together, we can make it. It is a family story. This is a really important story for us to remember today. It seems we have forgotten about being a people, a people who live in a world of reconciliation and forgiveness. A people who live in diversity, and respect. We, right here, have a story centered in a loaf of broken bread, made real by Jesus' love for us, and when we tell the story, and eat the broken bread, Jesus' brokeness makes us whole, our fragmented parts are put back together again. We are healed, we are whole, we are forgiven, we are set free. And in the gospel of Matthew our family story tells us about how followers of Jesus are in right relationship with one another, even when the relationships are troublesome. Churches are full of troublesome people, imperfect people, sinful people. And some of these people are us. Church though, in this part of Matthew is a future reality, it is not present in the mind of the author as we know it today. So this passage is not necessarily about church as we experience it today, but it is most certainly about family, about community, and about connections, it is most certainly about how we interact with one another, and I believe it is most certainly about how we approach one another with forgiveness. We don't forgive to help the other person, and we don't forgive for others, we forgive for ourselves. We forgive, because not forgiving kills us from the inside out. Forgiveness is never about the one forgiven, it is always about the one doing the forgiving. Jesus knows this, of course. Forgiveness is about right relationship. Being in relationship can be at times wonderful, at times fulfilling, and at times very very painful. Such is the nature of trying to love one another in a fallen world. We witness bad behavior and anger all around us in response to being hurt. Anger seems to be a more socially acceptable response to hurt, instead of forgiveness. I think this is so because so many people think forgiveness is about the other person. Like it is a transaction of some sort. You can only forgive if the other person is sorry, or if the other person changes their behavior, or if the other person does what you want them to do. But forgiveness is not a transaction. Forgiveness is about a transformed heart. Anger really gets us nowhere. Anger only kills us from the inside out. Anger only hardens our hearts and cuts short our lives. Forgiveness changes us. Forgiveness covers us with its grace. Forgiveness can even rewrite the narrative of our lives. And, just as importantly, we are forgiven. In all of our impetuous imperfection, in all of our risky races, in all of our messy murkiness, we continue to be the delight of God's life, we continue to be loved perfectly, and forgiven abundantly. God continues to come to us in love, God comes to us in the unreasonable incarnation, God comes to us in Jesus, in the bread, in the wine, in each other, and God says to us, there is nothing, absolutely nothing you can do that will separate me from you. God says, I forgive you now, and I will forgive you forever.